One of the most interesting applications for the novel SMA actuators is the use within grippers. At the moment work in two different parts is in progress. 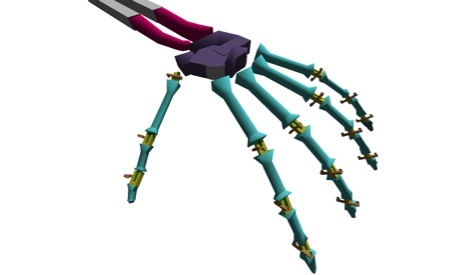 A gripper based on a PVC skeletton of a human hand is being developed and in parallel a robotic arm based on conventional servo motors combined with a micro-electronic for control. 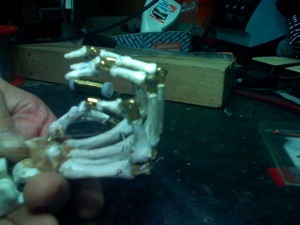 The hand consists 5 fingers and a wirst, that are actuated by in total 7 SMA actuators and several springs. The advantages over servo motors of the novel acutaturs and the control approach lies in the possibility to grip unknow objects and use the actuators in the fingers as sensors to detect their shape. 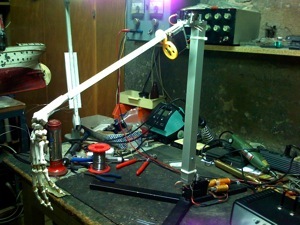 The actuator in the wrist can be used to to detect the weight of objects. Learn more about the actuators and the control approach. 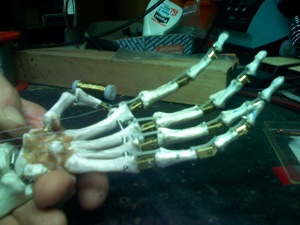 The hand consists of all bones of the human hand, but has only 17 joints at the moment. 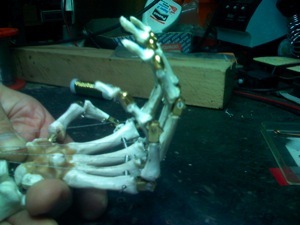 Therefore the every finger (expept the thumb) can perform a linear contration. In future, this will be advanced so that the fingers can straddle to to rise the variety of object sizes. 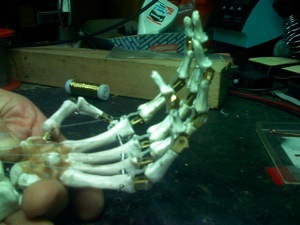 The thumb is actuated by two actuators, one to contract the thumb and one to generate a horizontal movement to position the thumb to the objects.